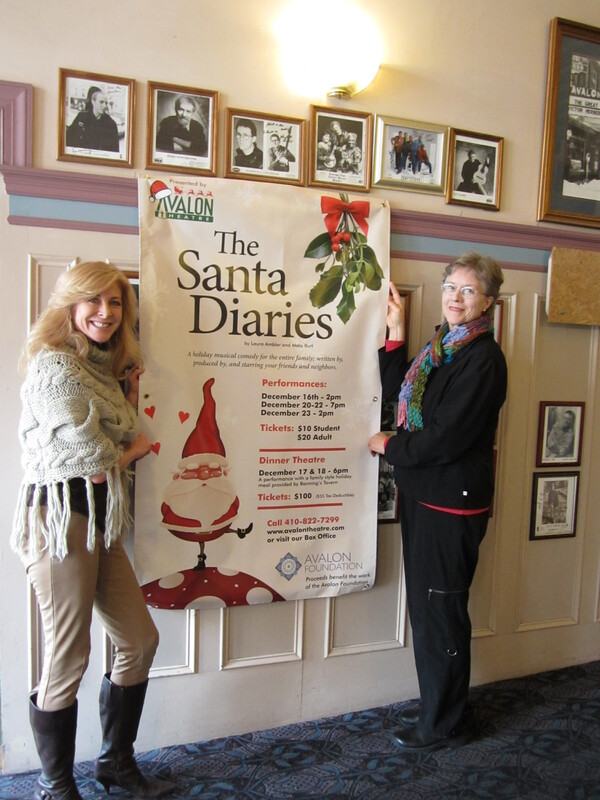 Santa Diaries Poster Unveiled | Does This Font Make Me Look Fat? We have been waiting for this. Finally the poster that Laura designed was approved by the Avalon higher-ups and has gone to the printer. The Dancing Santa is eye-catching. I am assured that posters will be available Monday, Nov 5. Avalon staff will scurry about town like Christmas elves so the poster will be in every window for next weekend’s Waterfowl Festival. Laura and I ordered a large weatherproof version of the poster that will be hung at the Avalon (hopefully outside where it will be most visible) for Waterfowl when the streets are thronged with people. My husband was in Albrights Gun Shop last week. It is right next door to the Avalon Theatre and the guys at the gun shop told him that 20K people come to Waterfowl and “they all come in our store”. I hope the big poster is up outside the Avalon where everybody who goes to Albrights (for hand warmers?) can see it. We want the play to be a huge success. All the money raised goes to the wonderful projects of The Avalon Foundation. We will do our best to get posters (11×17) into “off the main street” spots. If you know of any places that would post one, let us know. 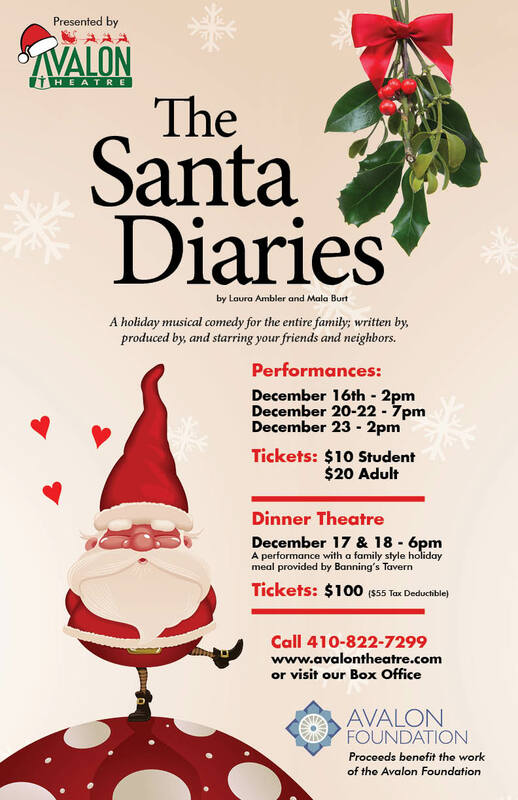 This entry was posted in Christmas, The Santa Diaries Play, Uncategorized and tagged Albright Gun Shop, Avalon Theatre, Laura Ambler, Mala Burt, The Santa Diaries, The Santa Diaries play, Waterfowl Festival by Mala Burt. Bookmark the permalink. So, when do tickets go on sale? Tickets are on sale now. Bring lots of people! Very cool blog titled! I wrote “Does This Font Make Me Look Fat?” on my Facebook status thinking I was the first to think of it. Oh, well.